The second scent from, the Anna Sui. This fragrance, housed in a bright blue handbag, contains notes of exotic fruit and floral essences. There are 7 reviews of Sui Dreams. I don't usually re-purchase fruity florals, but I just got my 2nd bottle of this, after a decade's hiatus. It was one of the few bottles that I drained dry (instead of giving away/tossing when I tired of them). It's sugary sweet, but light, so not cloying. It reminds me of cotton candy. If you don't apply much, it just fades, but if you thicken the application a bit, in a few hours, you have a delightful sweetness that magnifies your natural scent in a good way. You can't go wrong with it. It's even-tempered and easygoing. A good entry scent for the young, and a good anytime scent for the rest of us. I love vanilla in most fragrances, however in Sui Dreams I can't help feeling as if they've made the vanilla too syrupy and sugary sweet. The opening was rather disappointing with the vanilla and fruits creating a cheap and synthetic mix. It has an almost soapy quality to it which doesn't seem to work well as a perfume. As might be expected, this is a rather girly fragrance, most likely aimed at young consumers. In the pictures the bottle looks quite pretty, however in real-life the bottle is cheap, plastic and tacky. The blue juice also stains clothes. I don't know of anyone that wears Sui Dreams, but in my personal opinion this is light enough and childish enough to be worn by young girls. Must say that I'm disappointed that such a high price tag has been placed on such a cheap smelling fragrance. Certainly not something that I would personally buy. A really nice, sweet, kiss-me-quick type of fragrance. Light and suitable more for day wear. Attractive bottle as well. I've nearly finished the bottle I've had for years, but doubt I'll replace it as my tastes have changed slightly now. Think this is more suitable as a 'first adult perfume' type like Anais Anais, rather than an adult 20-something perfume, which is what I require now. Wonderful bottle, rather ho-hum fruity-floral fragrance. Why it is colored blue I cannot guess. I mostly get Creamsicle. However, on those days when one wants a sweet, orange-vanilla spritz, this one is very nice. Reminds me of what we used to call "orange drink" - a not-really-soda, not-really-fruit- punch thing that fast food restaurants sometimes served in place of orange soda. It was beyond artifical tasting and had a little sharpness to it. Sui Dreams recaptures this in a fragrance - the topnotes of tangerine and orange bitter really stand out and set the pace for this fragrance, which dries down into a softly vanillic, powdery, orangey scent that smells just like - yup, orange drink. Like the beverage, nothing in Sui Dreams smells quite real, as in natural; and in a way that's part of its charm, though the routine wears thin over time. Very much a lightweight scent, nothing incredibly moving or provocative about it. It's fun to throw on now and then but not the kind of fragrance I find myself suddenly dying to apply. It's just sort of - there. Notes are: top - bergamot, tangerine, orange bitter, peach, freesia, peony, rose, cedar, sandalwood, vanilla, skin musks. 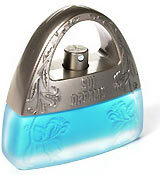 Anna Sui Sui Dreams 75 ML EDT Natural Spray. Vintage. There are no member images of Sui Dreams yet. Why not be the first?